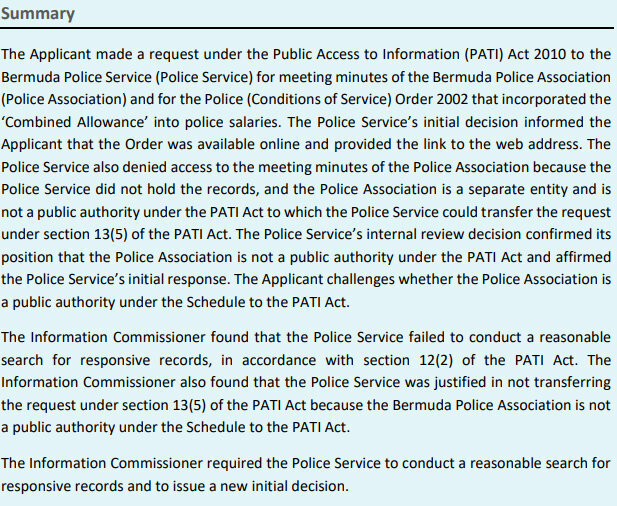 A spokesperson said, “On 27 November 2018, Information Commissioner Gitanjali Gutierrez issued Decision 11/2018, upholding the decision of the Police Service under the Public Access to Information [PATI] Act 2010 that it did not have to transfer a PATI request for meeting minutes to the Police Association because the Police Association is not a public authority as defined under the PATI Act. The requester sought access to meeting minutes of the Police Association related to the incorporation of a combined allowance into salaries. “In Decision 11/2018, the Information Commissioner explained that column 1 of the Schedule to the PATI Act defines ‘Public authority’. The definition includes entities established by statute and carrying out functions of a governmental or quasi-governmental nature, as well as entities owned or controlled by the Government or substantially funded by monies authorized by the Legislature. “The Information Commissioner found that the Police Association, although established by statutory provision, does not carry out governmental or quasi-governmental functions, is not owned or controlled by the Government, and does not receive funding from the government.